Gastric electrical stimulation (GES) with the Enterra device (Medtronic, Inc, Minneapolis, MN) has been previously shown to be a safe and effective treatment for recalcitrant diabetic and idiopathic gastroparesis. Patients who present with typical gastroparetic symptoms but normal gastric emptying study and those who develop gastroparesis following abdominal surgeries present a unique challenge in determining the optimal course of treatment. 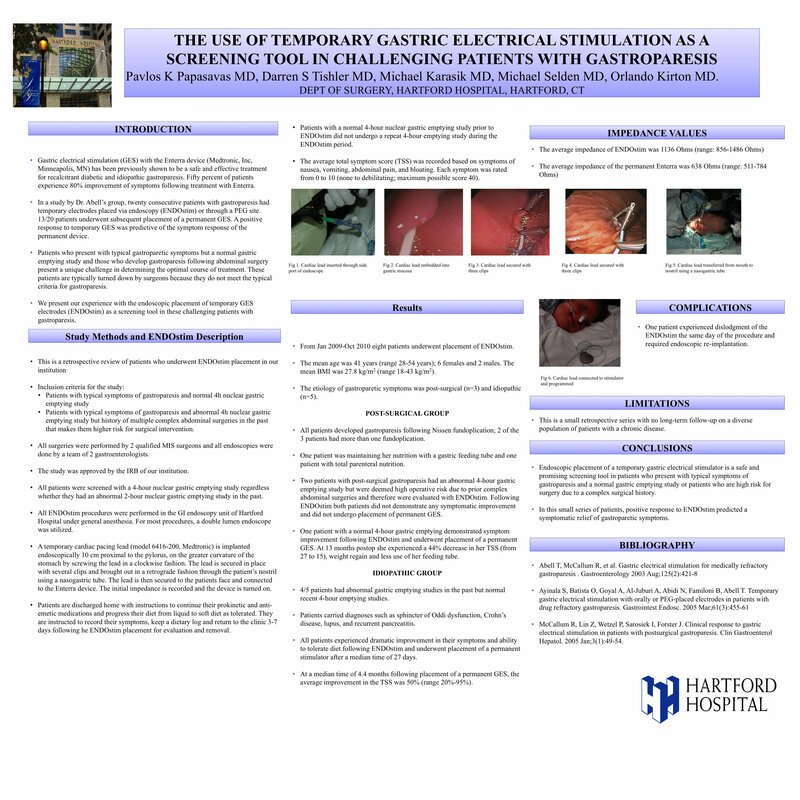 We present our experience with the endoscopic placement of temporary GES electrodes (ENDOstim) as a screening tool in challenging patients with gastroparesis. This is a retrospective review of patients who underwent ENDOstim placement. A temporary cardiac pacing lead was implanted endoscopically 10cm proximal to the pylorus on the greater curvature of the stomach. The lead was secured with endoscopically placed clips and brought out in a retrograde fashion through the patient’s nostril. The lead was then connected to the Enterra device. Patients recorded symptoms on a dietary log and returned to the clinic 3-7 days later for evaluation and removal. From Jan 2009-Aug 2010 five patients underwent placement of ENDOstim. The mean age was 43 years (range 35-54 years); 4 females and 1 male. The etiology of gastroparesis was post-surgical (n=3) and idiopathic (n=2). Two patients were maintaining their nutrition with a feeding tube and one patient with total parenteral nutrition. All post-surgical patients developed gastroparesis following Nissen fundoplication; 2 of these patients had more than one fundoplication. Two patients with post-surgical gastroparesis had an abnormal gastric emptying study but were deemed high operative risk due to prior complex open surgeries; these patients did not experience symptomatic relief following ENDOstim and did not proceed with placement of a permanent stimulator. Three patients had abnormal gastric emptying studies in the past but normal recent 4-hour emptying studies; these patients experienced dramatic improvement of their symptoms following ENDOstim and underwent placement of a permanent stimulator after a median time of 15 days. There was a 50% and 56% improvement in the scores for nausea and vomiting respectively, after an average follow-up of 3.4 months. One patient stopped using her feeding tube and the other patient uses her feeding tube intermittently. There were no complications following placement of the permanent stimulator. One patient experienced dislodgment of the ENDOstim that required endoscopic re-implantation. Endoscopic placement of a temporary gastric electrical stimulator is a safe and promising screening tool in patients who present with typical symptoms of gastroparesis and a normal gastric emptying study or patients who are high risk for surgery due to a complex surgical history. In this very small series of patients, ENDOstim predicted symptomatic relief of gastroparetic symptoms.